Solid Sterling Silver Thick Cuff with a beautiful Deep Pink Rhodolite Garnet. The Cuff has been designed and handcrafted by me using traditional Silversmithing techniques. 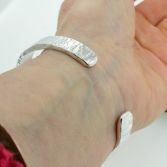 The Silver cuff is quite a heavy piece and measures 8.5mm wide and and is 2.4mm thick made from solid sterling. 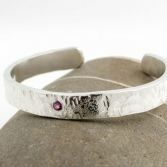 Silver, the surface has a hammered and tiny dimpled surface and a hammered edge. 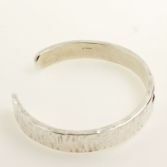 The cuff has a high polished surface which makes the different textures stand out. 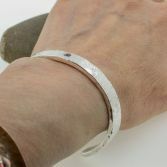 The cuff is suitable for a medium to large sized wrist. This is a one of a kind as i have only made one. 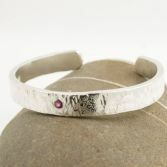 The Rhodolite Garnett Gemstone is very pretty and is 3.5mm in diameter and has been set into the band so it sits flush with surround silver. 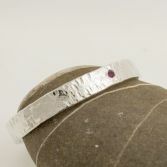 Your Silver & Rhodolite Garnett Cuff has full UK hallmarks applied at the Edinburgh Assay Office. 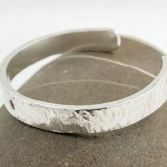 Your Silver Cuff will be presented to you in one of my signature gift boxes and posted via Royal Mail special delivery (signed for) to any address in the UK free of charge.